Following a regular maintenance schedule is a crucial part of RV ownership. The engine, transmission and cooling system are obvious focal points of any inspection. Same thing with the electrical system and power generation components. An RV’s roof is much like a house’s roof in the sense that it is often ignored until there is an expensive problem. The goal is to maintain the roof in the best possible condition. This not only ensures a long life for the roof, but it also protects from severe damage caused by leaks. Some things to look out for on an RV’s roof include delamination, deterioration and leaks around seals. Damage to lamination can cause rust, which in turn will cause a host of other problems that will be expensive to fix. Water which finds its way into the RV can cause a myriad of problems. Moldy upholstery and carpeting, warped woodwork and electrical damage are some likely problems caused by a leaky roof. 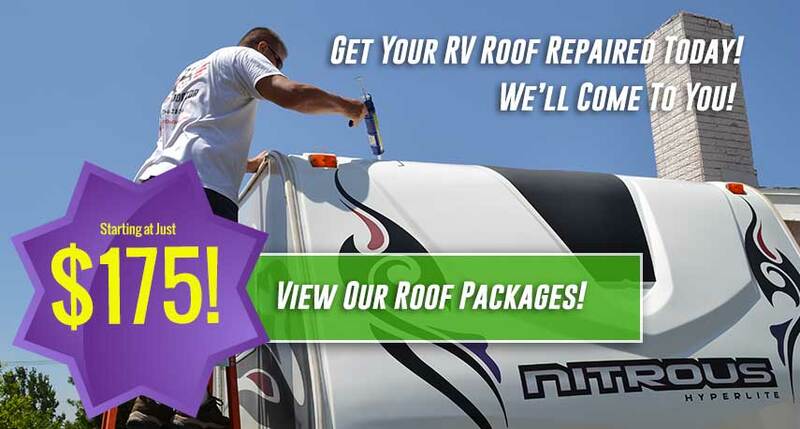 When performing an inspection on your RV’s roof, you must keep in mind not only your own safety, but be careful not to cause damage to the roof. Keep clear of fragile areas such as those near vents and the AC units. Not only could you damage these areas, but you could get hurt yourself! Remember to tread gently on the roof. It would not be hard to damage the rubber membrane that aids in waterproofing. Critical leak points on an RV roof include anyplace where the roof is sealed. AC units, antennas and other components require sealant and should be inspected at least twice per year. Sealant around the edge of the roof should also be inspected at this interval. We have covered inspection to prevent leaks, but there is another often overlooked aspect of RV roof inspection. Debris should be cleared from vents, the gutter system and the exterior of the AC unit as often as possible. Some RVs have additional components which need to be cleaned often. This is all part of regular maintenance which can detect problems before they become too complicated and costly. Unless you are an expert, you may feel more confident having an experienced professional perform these critical inspections. Enlisting the help of a pro would also be safer, both for you and your RV. From regular service check ups to interior & exterior cleaning, The Toy Doctor offers a wide variety of maintenance options for your RV. Let us perform your monthly, quarterly & annual maintenance to save you from costly repairs. Contact us today for a free estimate with no destination charge.